I think I may have a Netflix hangover... I am feeling more than a bit sluggish today (all the coffee is necessary) after my 'just one more episode' session last night. Just one more turned into just five more but I've started watching Wentworth (think OITNB but way grittier and Australian) and am full on hooked. 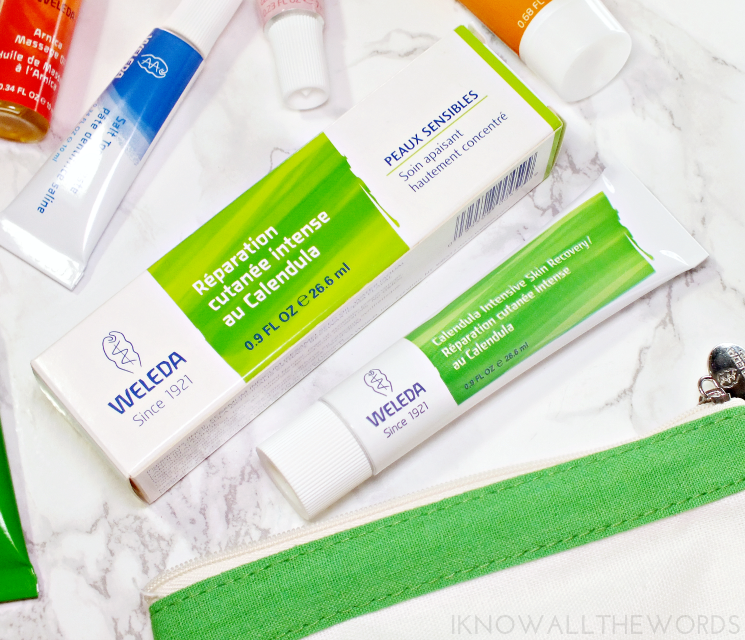 Which actually ties into today's post, as I am also full on hooked on Weleda. Somehow, I've come this far without knowing much about the brand and their offerings but thanks to the Mighty Essentials Travel Kit, I'm making up for lost time. 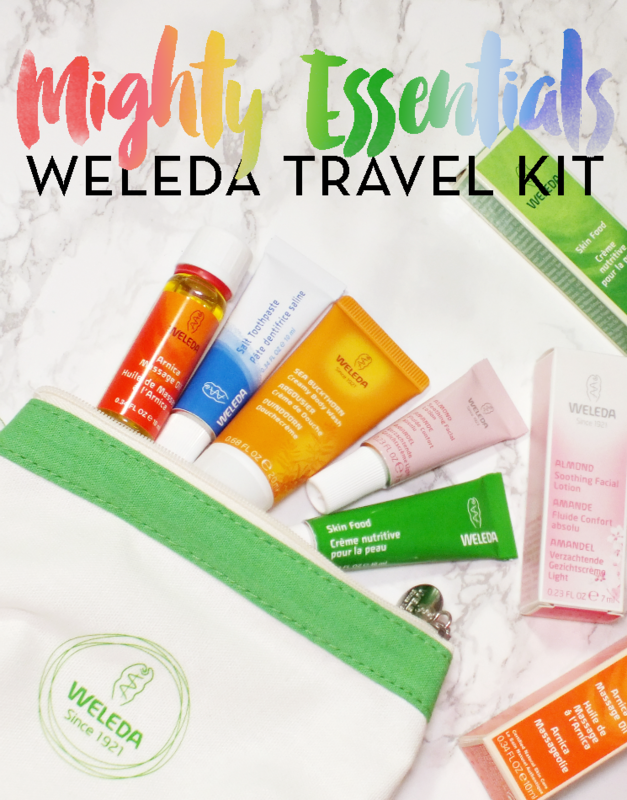 The Weleda Mighty Essentials Travel Kit is the perfect way to sample Weleda, if like me, you're new to the brand. It includes travel size offerings of five of their most popular products. 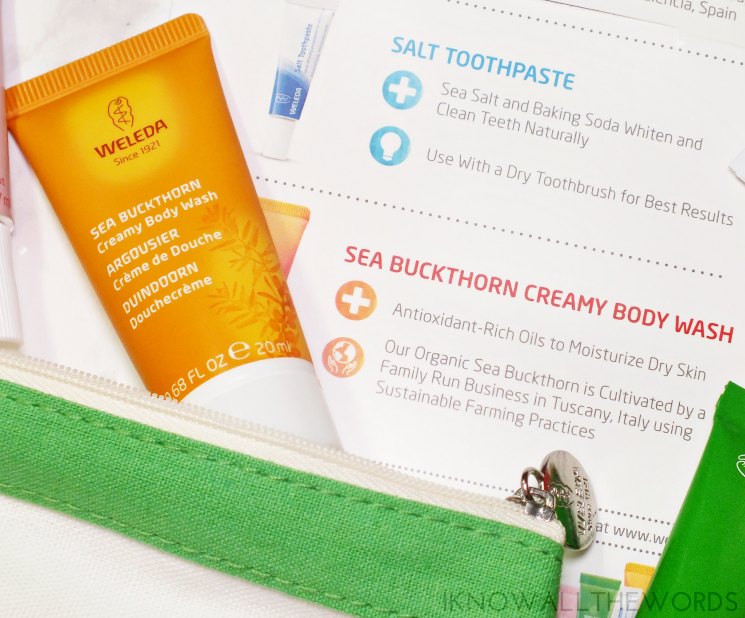 Valued at $25, the kit not only includes five products (that sell individually for $3 USD /$4.40 CAD) but also come in a cute little fabric bag and with a $3 off coupon toward the purchase of a full-size Weleda product. I didn't receive any info with the kit, but my sleuthing has uncovered that in the US, the kit sells for a mere $5 with all of the proceeds going to charity, and is only available in stores. Skin Food is the product i immediately think of when Weleda comes up. It's a fan favourite, and for good reason. The intensive balm-like moisturizer is thick and rich and a true teat for dry and irritated skin. It can be used anywhere on the body that needs some hydration and TLC thanks to the formula that includes rosemary leaf extract (a mild antiseptic), organic calendula flower extract and sunflower. 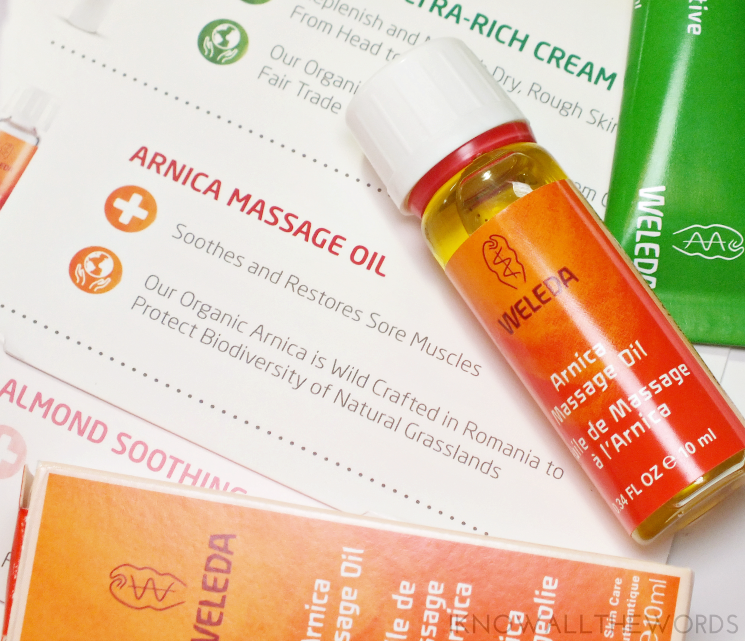 Achy, sore muscles get a bit of relief (while also hydrating skin) with the Arnica Massage Oil. Featuring sunflower and olive fruit oil, arnica, birch leaf extract, and essential oils, the oil has a mild warming sensation on skin for added soothing. 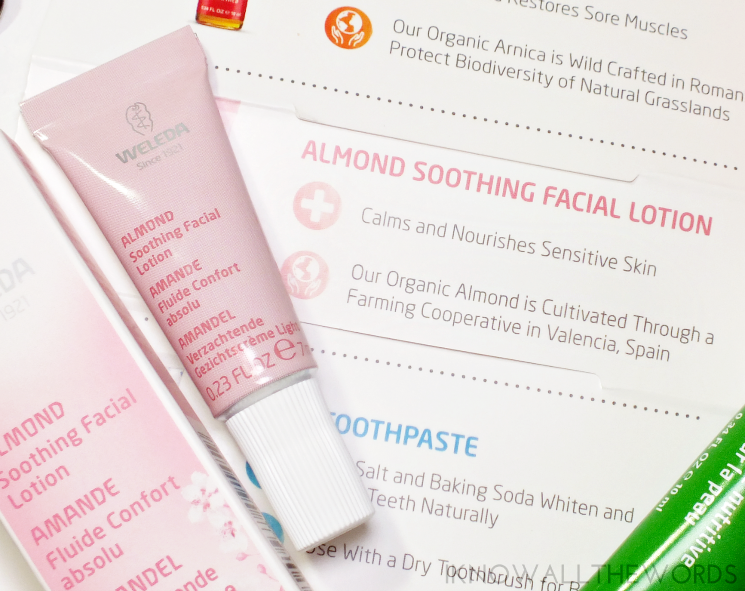 I am a sucker for just about anything almond, and the Almond Soothing Facial Lotion is no exception. With a light-feeling, but rich texture the naturally almond scented cream calms, hydrates and soothes sensitive skin with a formula that includes organic sweet almond oil, prune seed oil, and beeswax. 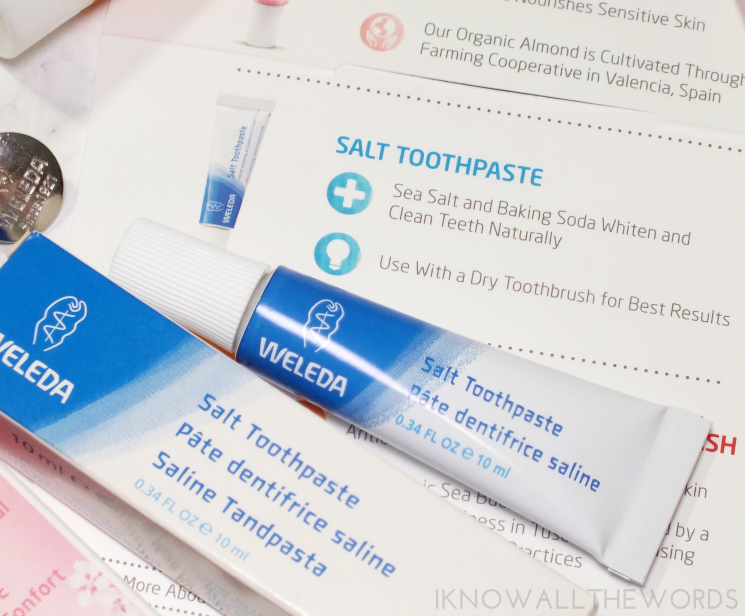 I've been immersing myself in the world of natural toothpaste lately (reviews to come) so the Salt Toothpaste was a nice surprise. Different, but nice. This toothpaste features baking soda and sea salt as the main ingredients with peppermint extract for the minty freshness we're all after. While the formula leaves teeth feeling very clean (and is said to be a great whitening toothpaste) it does have an odd salty taste that even peppermint can't mask. Most of the Mighty Essentials are for the face, but the Sea Buckthorn Creamy Body Wash is shower ready. With its subtly citrus scent, this cream shower gel is nicely hydrating thanks to the antioxidant rich blend of oils while gently cleansing. Bonus product! The Calendula Intensive Skin Recovery isn't part of the Mighty Essentials kit, but it is the type of product everyone should have on hand. The balm-cream features 20% calendula extract (handpicked in Germany, of course) that in combination with sesame seed oil, lanolin, and beeswax, work to sooth and calm irritated skin, reduce redness and moisturize. Weleda recommends the cream for use after sun exposure (aka too much of it) and shaving. I recently gave my self a nice patch of razor burn, and was amazed at how quickly this worked to reduce the pain and the redness. It was magical actually. I've since used it on a cat scratch and was equally impressed. 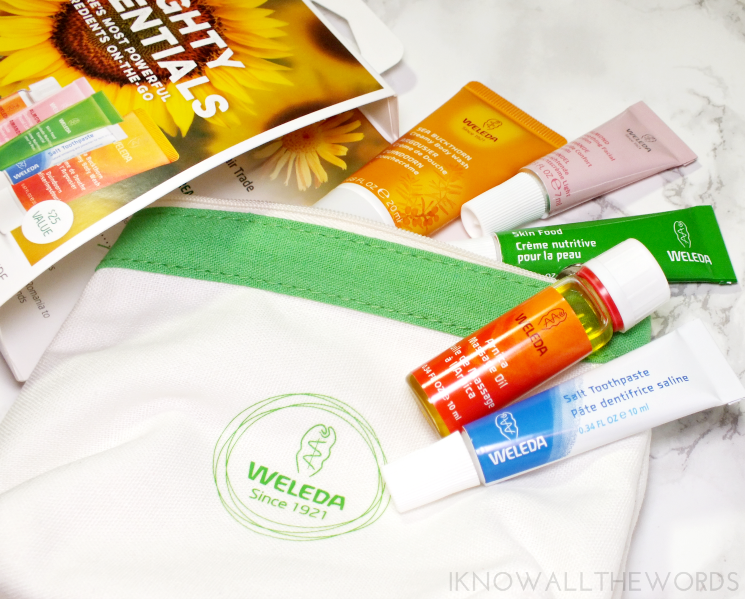 Overall, I'm a new-found fan of Weleda. their formulas are thoughtfully crafted to be effective and naturally based with all products being certified natural, fair trade, and cruelty-free. 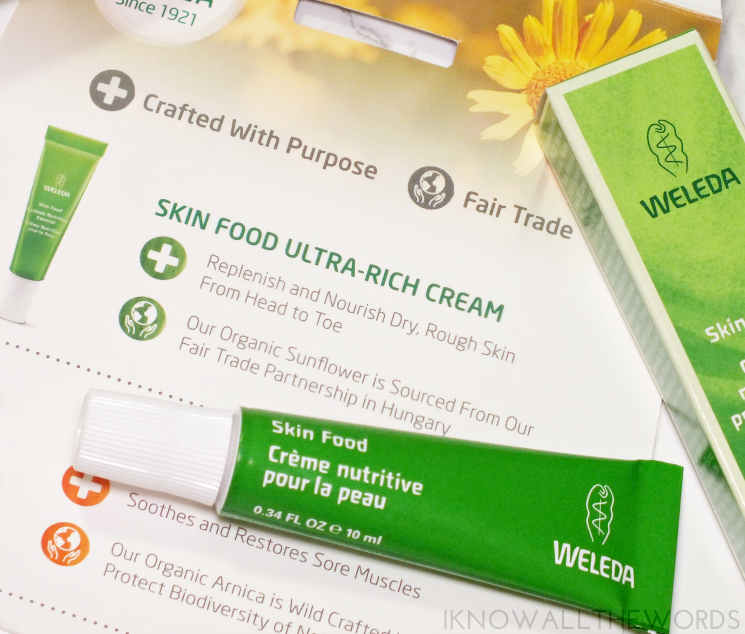 Are you a Weleda fan? tried any of these products or have a favourite I need to try next?